Notes A large fossil skull that racers can drive underneath is near the end. 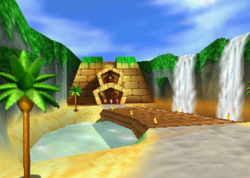 Jungle Falls is the third track of Dino Domain, including Diddy Kong Racing and its Nintendo DS remake, Diddy Kong Racing DS. Despite the title, the stage is set in a prehistoric area with waterfalls. The player can only access it if they have three Golden Balloons, or eight for playing in its Silver Coin Challenge. Unlike its Dino Domain track group, its music changed in the DS version of the game. The track also lost its dinosaur tracks that occupied the start of the track in the N64 game. The course starts with a path that curves around a few ponds. There a some dinosaur tracks across the road. On the outer ledge, players can use a dash panel and grab a few bananas. On the turn to the right, there are red balloons and green balloons. Players can use a dash panel (with a blue balloon near it) behind these balloons. Players drive across a bridge there. If they fall, they must use a ramp to get back into the track. After the bridge, there is a tunnel that is split in two pathways. Racers can decide which path to take, but only Planes can fly through the top one. The bottom tunnel is accessible from any vehicle. The narrow top tunnel is slightly shorter and has a Rainbow Balloon while the bottom one is surrounded by one Yellow Balloon and two Red Balloons. Both tunnels end with a right turn. A single Yellow Balloon is located outside the tunnel exit. After a turn to the right, there is a gentle slope with some Bananas, Red Balloons, and Green Balloons. A large dinosaur skull follows shortly after the slope. It has a Zipper underneath, which boosts racers through a narrow path enclosed by rows of skeleton spikes. A Rainbow Balloon appears behind the last spike rows. The racer must make another quick right turn to reach the finish line. On the water below the bridge. After the exit of the tunnel. The road to the finish line, with bone pillars on each side. This page was last edited on December 18, 2018, at 18:01.